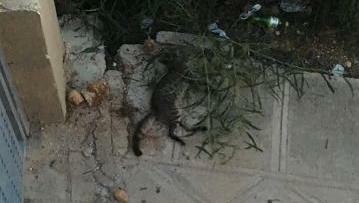 A photo of the dead kitten uploaded to Facebook on Monday. Stephanie Cassar was at her Golden Bay restaurant on Sunday evening when she heard that a man had killed a kitten just outside. “I went round and saw a group of people standing there,” she told the Times of Malta. By the next morning, news of the incident was plastered all over Facebook – and many were pinning the blame on Ms Cassar, her elderly mother and their family business. “Hateful messages poured in nonstop. People saying they were going to boycott us, others calling us demel [trash] or saying the kitten’s fate should have been ours. I can't repeat some of the things people have told me... I'm honestly frightened,” she said. It got so hard to keep up with all the vitriol, that Ms Cassar did the unthinkable for a 21st century business: she took the restaurant's Facebook page offline, and its phones off the hook. "It just got too much," she said, her voice crackling under the strain. "We couldn't cope." By Tuesday afternoon, Ms Cassar had hired a lawyer and filed a police report alleging online harassment. Rage was sparked by a Facebook post uploaded by a patron who had been at the restaurant at the time. In that post, the eyewitness suggested that the man who killed the kitten had been aided by an elderly woman, who disappeared along with the mystery man. She was identified as Ms Cassar’s mother. The reality, Ms Cassar claims, was more prosaic. “My mother has no idea who this man is,” she insisted. As tempers flared and people began pointing the finger at her elderly mother, Ms Cassar decided to send her home. “She was shaken... white as sheet,” she recalled. Police have yet to identify a suspect or charge anyone with a crime, but that did not stop Facebook vigilantes from sharing photos of a man they said was Ms Cassar's father and responsible for the kitten's death. "He should be burned alive," one user wrote beneath his image. "Please video it if you do, I'd be delighted to see him burn," another replied. According to Ms Cassar's lawyer, police are not treating her father as a suspect. Ms Cassar’s claims would appear to make her the latest victim in a growing number of so-called trials by social media. Earlier this month, police sources debunked claims, which also went viral on Facebook, that a man had tried to abduct a child at Għadira Bay. In May, Facebook vigilantes began sharing the photo of a young man they said was responsible for mowing down a policeman in Luqa. His only crime? Sharing the same name as the alleged perpetrator. The problem is amplified by the speed with which misinformation travels online. A study published earlier this year by the journal Science found that a falsehood reached 1,500 people on Twitter roughly six times faster than truth. “Falsehood diffused significantly farther, faster, deeper and more broadly than the truth in all categories of information,” researchers wrote. Research data is unlikely to be of much consolation to Ms Cassar, however. Having filed a police report about the incident on Monday, she spent the rest of the day holed up inside her office, trying to stem the reputational damage caused to her business.